- programming with C, especially under LINUX. 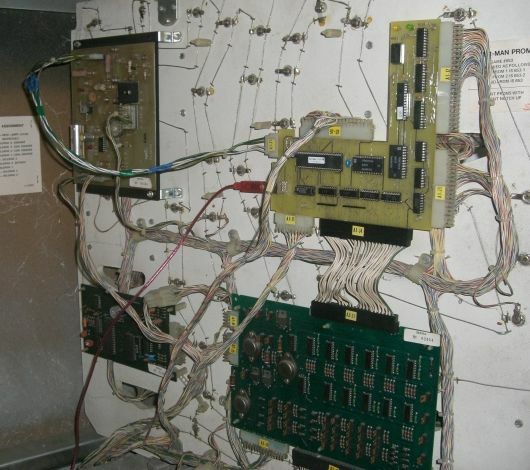 Goal of the project is to replace the System 80 MPU of a Gottlieb System 80 pinball machine. Because I have absolutely no commercial interest with this project, I designed it as simple as possible. will find a lot of old TTL stuff on my board. at http://www.pcbpool.de/ , as long as you send the layouts to pcb-pool. 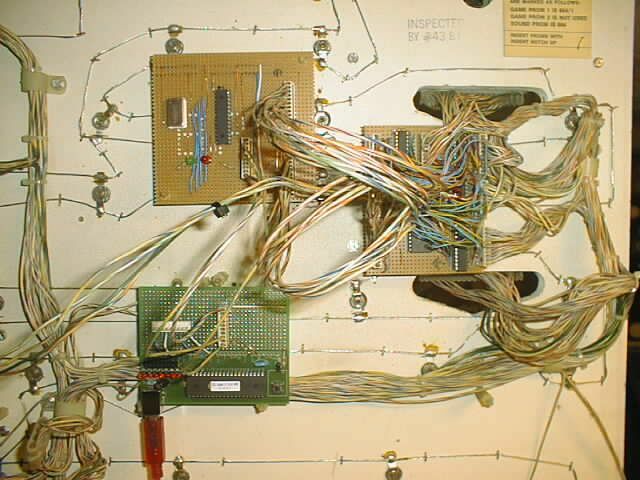 - a Gottlieb System80 pinball machine, the MPU will be replaced by LISY80. is based on a 300 MHz HP desktop and a 500 MByte hard disk. - PIC 16F872 for controlling the displays. - PCF8574 for die control some of the coils. The link to the PC hardware is done by the USB interface. For this I use the IO-Warrior 40 (data sheet ). There is a IO library for Linux as well as for Windows available. For details visit Code Mercenaries. 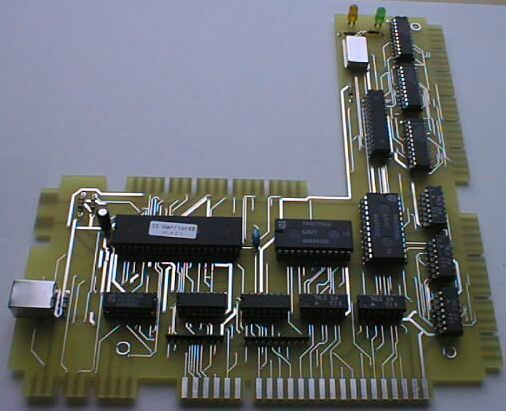 IO-Warrior could handle a 8*8 switch matrix, so this fits perfect in a pinball design. on the PIC16F872 (data sheet) and wrote another C program to control the display refresh. The PIC is controlled by the IO Warrior over I2C Bus. Because mostly all of the IO pins of IO-Warriors are covered, I had to add an I/O-Extender PCF8474 (data sheet). Der PCF8574 extends the IO with 8-Ports, controlled via I2C bus. Below a picture of my very first version. At the left top you see the PIC circuit for the display refresh. 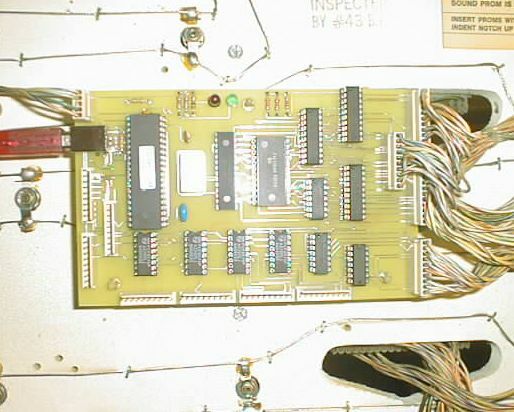 At the right there is a special 'driver board', at the bottom left you could see the original IO-Warrior 'starter kit' circuit. With this it was possible to control all the displays. 3.2 second version, first 'real' circuit board. Based on version 1, I designed my own circuit. For this one I used a lot of PCF8574 and standard connectors. by LISY80. The red USB cable in the middle connects LISY80 with the PC (external for now). Spiderman with LISY80. You could see the writing 'LISY80' at player one, and the version number (v. 0 05) at the status display. - every following pressed switch counts 10 points for player one. - if the ball went in one the 3 holes, it is ejected immediately. - if the ball goes 'off' ( OUTHOLE switch is pressed), the program ends and Game Over lamp is activated. The test proofs, that it is possible to control all pinball function. 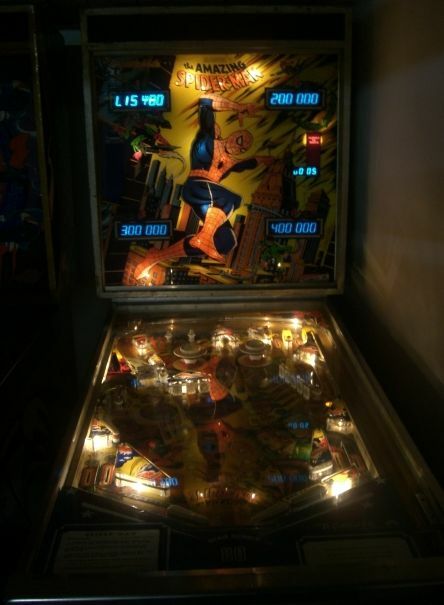 Next step is to implement the original gameplay of a Gottlieb Spiderman pinball.